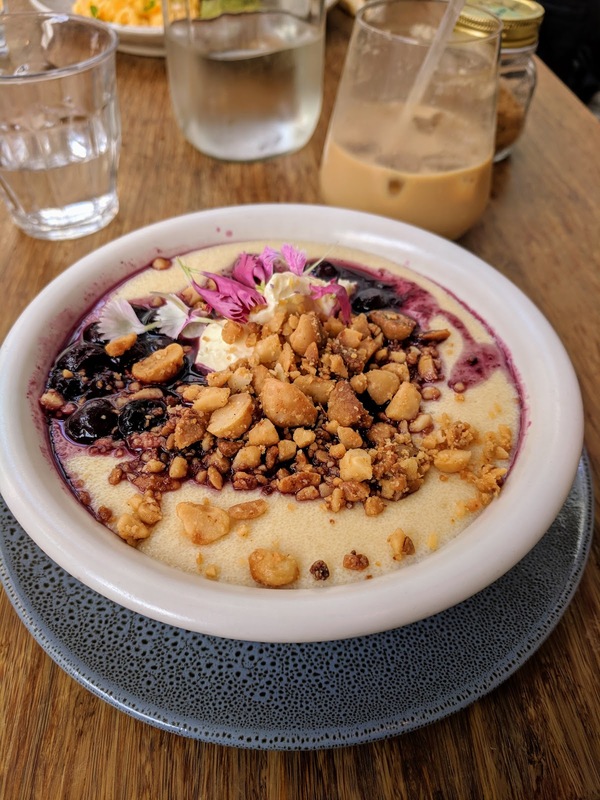 We discovered Devonport in Auckland on our recent trip to the North Island of New Zealand. Situated just across the harbour from downtown Auckland, Devonport is an ideal home base for a visit to New Zealand's largest city. We rented an Airbnb in Devonport and enjoyed pretending to be locals for four nights. Devonport is also a great hub for day trips around Auckland. Read on for ideas of day trips you can do by car or ferry from Auckland's Devonport neighborhood. Why Stay in the Devonport Neighborhood of Auckland? You may wonder why we chose to stay in Devonport rather than in downtown Auckland. Devonport is a popular local community with thousands of commuters boarding the ferry every day for high powered jobs in downtown Auckland. Devonport features quaint homes and a charming main street with shops and restaurants. Parking is a breeze in Devonport and the ferry terminal opens up a bunch of possibilities for day trips as you'll see below. We knew we'd be heading to the Bay of Islands in the Northern part of the North Island of New Zealand and knew that staying in Devonport would shave a decent chunk of time off of that drive. On the whole, Devonport Auckland was an ideal place to station ourselves for a few days. So, where can you visit from Devonport? Our first day trip was the most obvious. We hopped on a ferry for the quick trip to downtown Auckland. How long does it take to get from Devonport to downtown Auckland by ferry? Just 10 minutes! How much does it cost to take the ferry from Devonport to Auckland? $12.50 NZD for a return ticket at the time of writing. Driving takes at least twice as long and is highly dependent on traffic. On the way, we were treated to stunning views of Auckland's skyline including the iconic Sky Tower. By taking the ferry, we didn't have to worry about parking on arrival in Auckland saving both time and money. We spent some time walking around Auckland's downtown core. It was fairly rainy when we visited so we spent most of our time indoors eating and drinking. 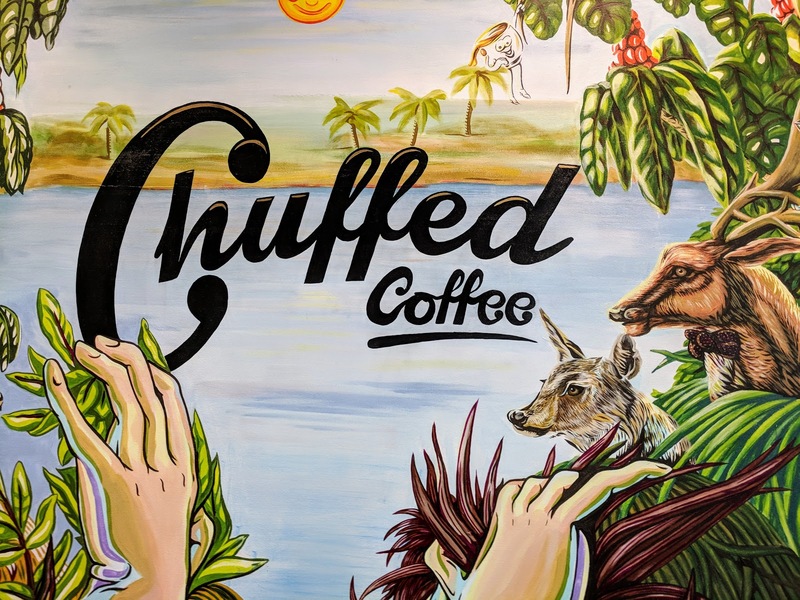 Not a bad way to spend a day if you ask me :-) Start the day with a visit to Chuffed for brunch. Iced coffee and oatmeal with berry compote and macadamia nuts really hit the spot. We chanced upon Bohemein Fresh Chocolates on O'Connell Street and treated ourselves to some spicy chilli ganache to fuel our exploration of Auckland. 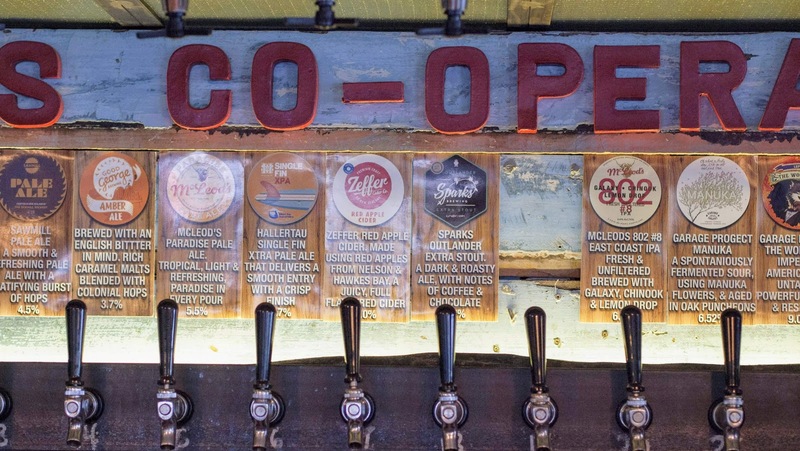 We ended the day at the Brewers Co-Operative for a couple of pints of craft beer and kumara fries (kumara is a kind of sweet potato that is really popular in New Zealand). I tried the Oh What A Lovely Day, Let's Go Out and Pick Some Manuka, a Sour Ale and Orange Sunshine Pale Wheat Ale from the Garage Project. Such a great way to spend a rainy day in Auckland! We also wanted to get outside of Auckland and explore the surrounding area. Once again, Devonport was an ideal home base for exploring. We set our sights on Piha Beach for a scenic day trip. On the way, we discovered Arataki Visitors Center, a tourist information center with amazing views over the Auckland Harbour. Arataki Visitors Center is about a 45 minute drive from Devonport and is a good stop for clean bathrooms and snacks. Piha Beach is located about an hour from Devonport by car on winding roads. If you are prone to motion sickness, it would be a good idea to bring some Dramamine or Kwell just in case. The sometimes harrowing drive was completely worth it though for the amazing beach views that we discovered just above Piha Beach. Descending to the beach itself, we followed the signs for parking on the beach only to be discouraged when the parking lots were both small and full. Don't give up! 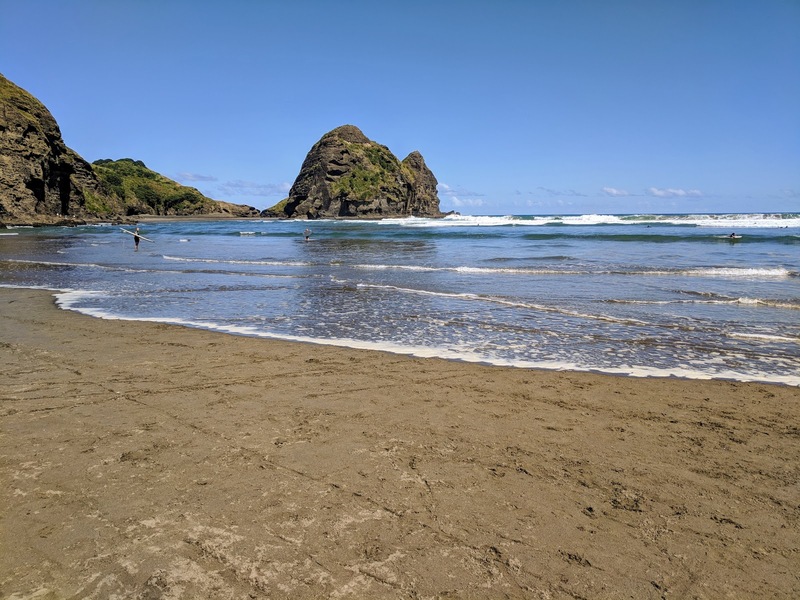 Navigate toward Piha Store and you'll discover a much larger parking lot on the grass than is just a 5-10 minute walk from the beach. We strolled along Piha beach watching surfers try to catch the perfect wave. The crystal clear water lapped closer and closer as the tide started to come in. 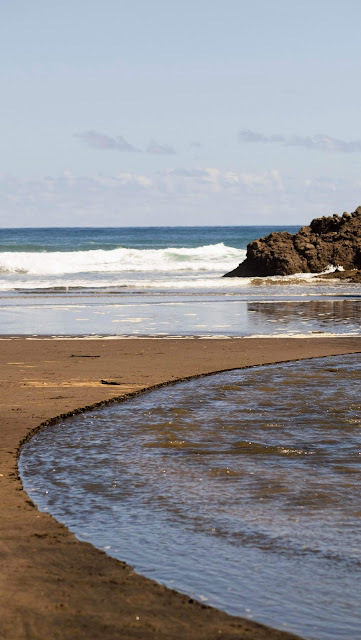 Small channels developed between the sea and Piha Stream making for some amazing photo ops. 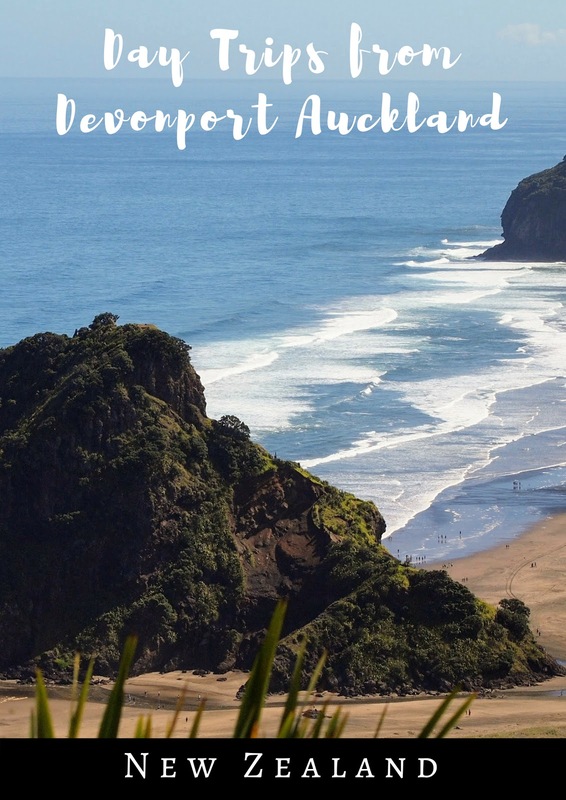 Piha Beach is definitely an ideal spot to get in touch with nature and relax on a day trip from Devonport Auckland. While Piha Beach was our main day trip goal for the day, there are other attractions nearby including a couple of waterfalls (Karekare and Kitekite Falls). 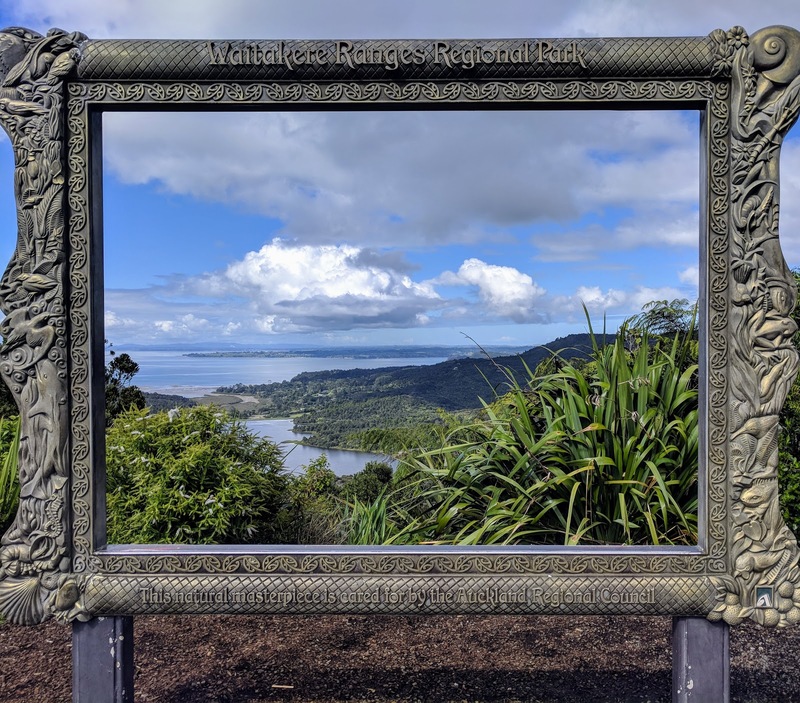 At a stretch, you could potentially visit both waterfalls in a day from Devonport, but we decided to keep our day trip more chill and relaxing with less driving and chose to drive to Kitekite waterfall and do a short hike. 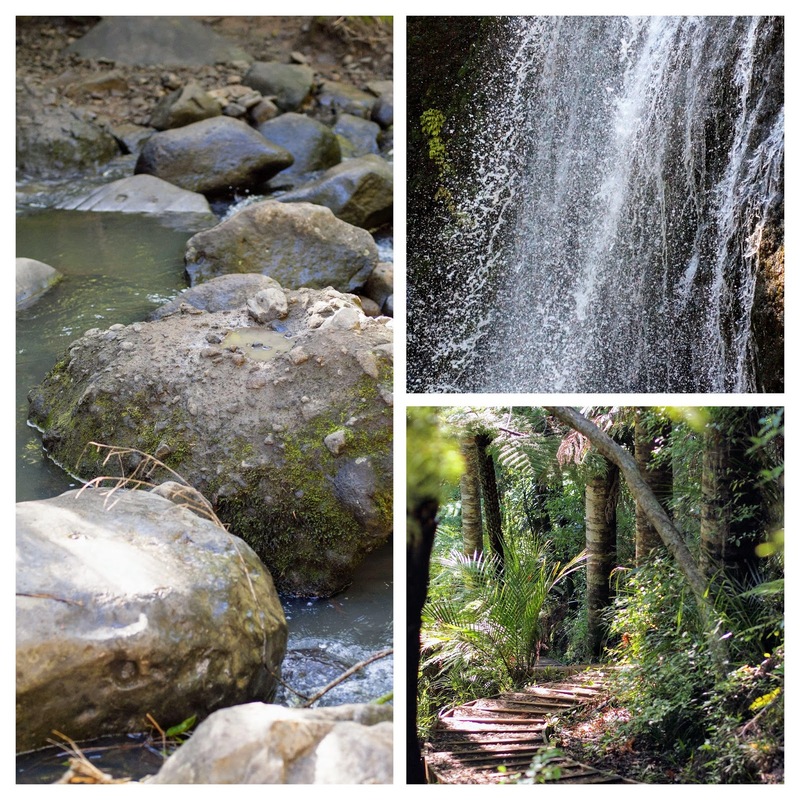 You can hike a loop trail from a parking lot to Kitekite Falls or walk to the falls and then backtrack. It's helpful to bring a waterproof bag for any electronics if you decide to do the loop trail. The best views of the waterfall involve fording a shallow but fast moving stream. In addition, if you continue on after you get to the waterfall, you'll have to balance on a series of rocks to get across another small stream on the way back to the parking lot. I have to say, it was a bit more of an adventure than I bargained for. Fortunately, we did make it without too many problems: just one wet shoe from losing our balance trying to cross the stream. At least there were no phone or camera mishaps! 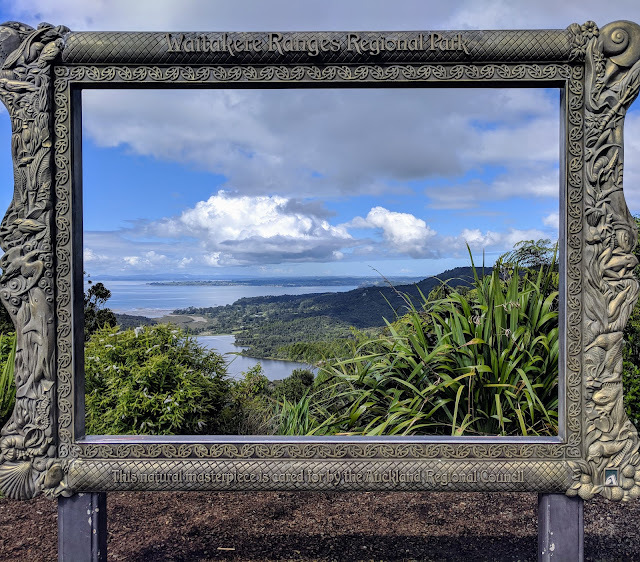 Note: As of July 2018, Kitekite Falls is closed due to the spread of Kauri dieback. More information on track closures can be found here. A day trip from Devonport to Waiheke Island is a "must do" on a trip to Auckland. There are a few direct ferries from Devonport to Waiheke Island (35 minutes, $38.00 NZD round trip at the time of writing). 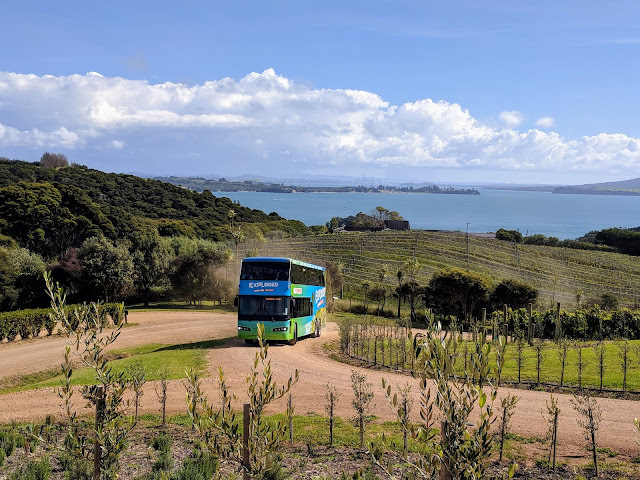 Ferry service from downtown Auckland to Waiheke island is much more frequent and you can then connect with the regular ferry service that runs between Auckland and Devonport. Fullers Ferries offers an option where you can add on the Waiheke Explorer Hop-on Hop-off bus to your ferry ticket. It cost us $60 NZD per person at the time of writing for the return ferry ticket plus all day hop-on hop-off bus service. What is Waiheke Island known for? Wine, primarily. Waiheke Island is a popular weekend getaway for Kiwis who live in Auckland. Most Waiheke Island wineries don't open until 11 am or later so we started our day with coffee at the Boathouse and a walk along Onetangi Beach near the far end of the bus route. Next up, we sampled fine Waiheke Island wines with wine tastings at neighboring vineyards Stonyridge and Te Motu. 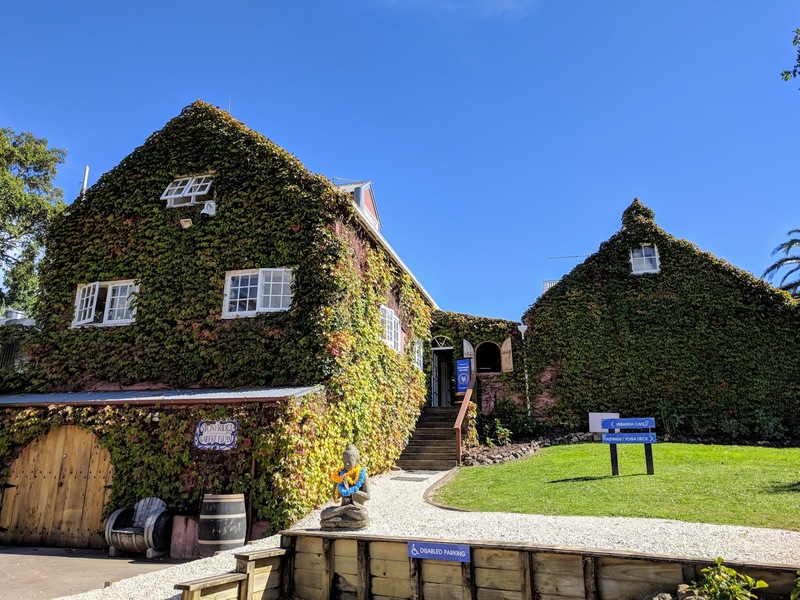 Waiheke Island wineries do charge for wine tastings. 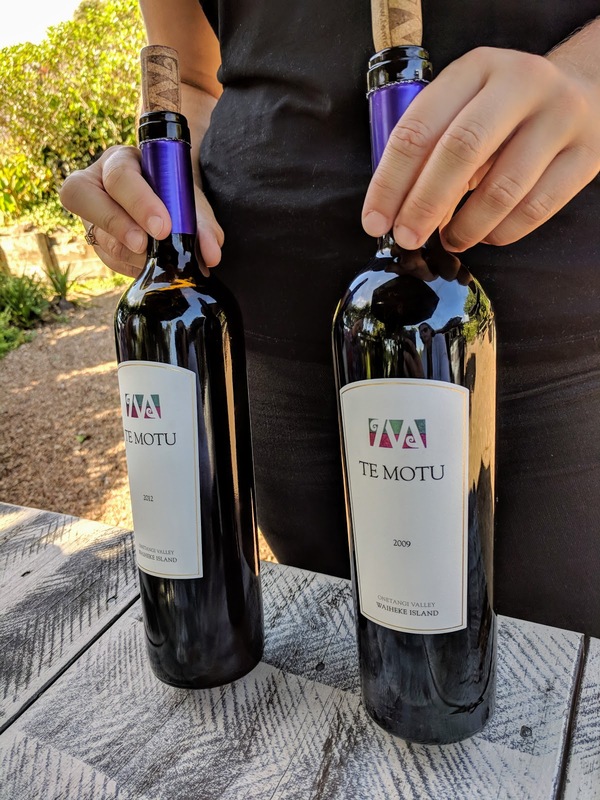 We paid $10 NZD for 3 wines at Stonyridge and $20 NZD for 5 wines at Te Motu. We sat in the sun for a relaxing lunch at Wild on Waiheke. 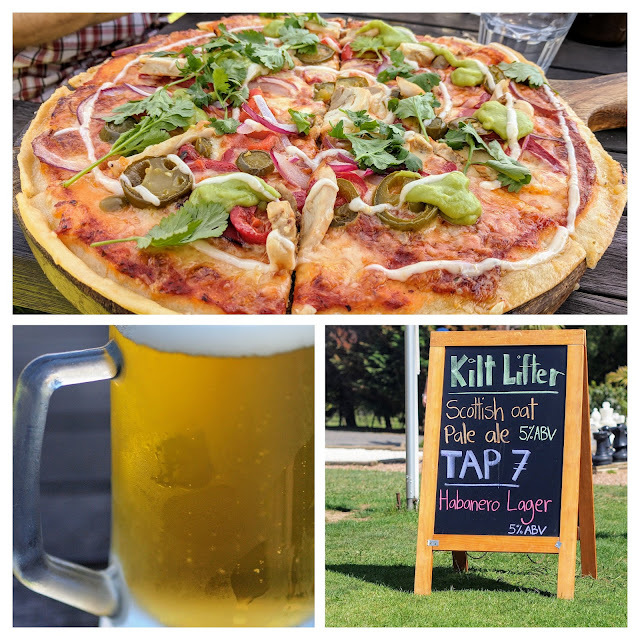 A spicy Tap 7 Habanero Lager beer paired well with a hearty pizza. Such a fun and casual place to grab a bite! We finished our day trip to Waiheke Island at Mudbrick for a tasting of 4 wines for 10 NZD. We climbed the steps behind the vineyard for stunning views at the Helipad. Unfortunately we were a bit rushed to catch the last hop-on hop-off bus that would take us back to the harbour to connect with the direct ferry to Devonport. I would have liked to spend another hour exploring the luxurious grounds at Mudbrick. As you can see, there are a variety of places to explore if you set up a home base in Devonport Auckland. For more on the destinations that we visited on our day trips from Auckland's Devonport neighborhood, check out this handy map. 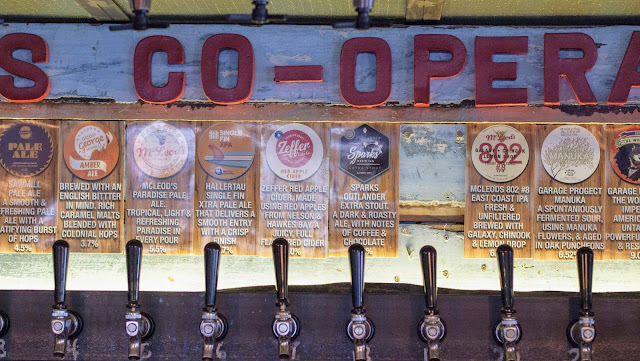 Read about day trips from the Devonport neighborhood of Auckland New Zealand. Read about things to do in and near Devonport New Zealand by car and ferry.